Summary: Arnison Crag is a fell located close to the village of Patterdale at the southern end of Ullswater. Wainwright did not include it on his first list but did so on his second and in the final 214 in the Pictorial Guides. He took the name and height of 1424′ from the O.S. maps of the day as on the equivalent Bartholomew map it was named as Blease End. 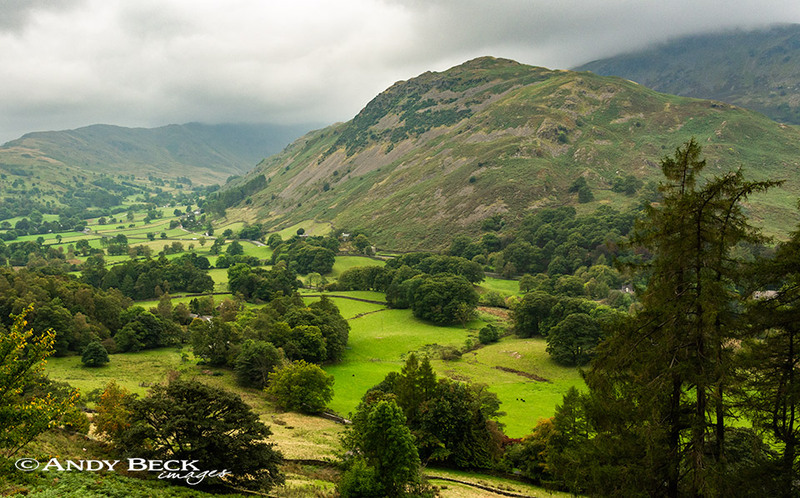 The fell can easily be ascended from the village on good paths with fine views back towards Ullswater. From Arnison Crag a route can be taken onwards to Birks and St. Sunday Crag. South from the summit the ground undulates over other nameless hillocks of a similar height but the recognised Arnison Crag summit is that shown by Wainwright in book one- The Eastern Fells. Topographical features: The true height of the summit has been re-surveyed to 1421′ 433m, three feet lower than the altitude given by AW and his maps, GR: NY39357 14968. The highest ground has a couple of rock platforms, in the past a small cairn sat on the recognised highest (on the left in the image below) but now a cairn is on the grass to the right. These small markers are not a permanent feature and are prone to being moved about. Wainwright’s summit is the rock platform on the left. Points of interest: Glenamara Park on the northern slopes of the fell is a pleasant mixed woodland. Oxford Crag is popular rockface for novice climbers. The best view is the aspect of Ullswater but the surrounding high fells dominate most of the scene. Tarns: A reedy unnamed tarn sits just below the summit crags to the south. At the foot of the fell near Patterdale is White Moss, a rubbish tip in AW’s day but now cleared. 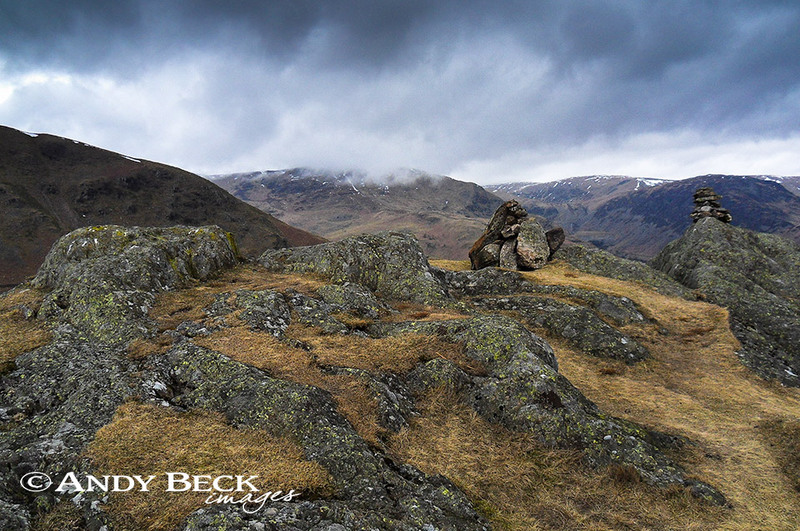 Adjoining Fells: Birks which can be reached via Trough Head. Nearest facilities: Car parking at Patterdale with pay and display park opposite the Patterdale Hotel. Patterdale has a shop, The White Lion pub, hotel and acommodation. Youth Hostel in Patterdale also available. Toilets in the village. Star rating: (1.5 / 5) a nice simple little fell, ideal for a stoll if you have an hour or two spare. Not much of interest or exciting views but handy for facilities.